In the subfreezing morning of January 15, 2012, our family and 14 other fellow pilgrims embarked on a historical tour of the Evansville Diocese. Our first stop was the basilica of St. Francis of Xavier, formally founded in 1748 on the banks of the Wabash River. Our 5th son, Will, was barely a month old. For the next five and a half years, our family and the accompanying pilgrims would travel once a month to the next oldest church and eat at a restaurant nearby. By the time we reached our final visit on Pentecost Sunday in June of 2017, we had visited 65 churches and traveled roughly 4,500 miles. In the meantime, our family continued to grow just as the graces unveiled themselves through this spiritual journey. Each visit reflected both the uniqueness of the individual parishes and the collective beauty and history of the diocese as a whole. 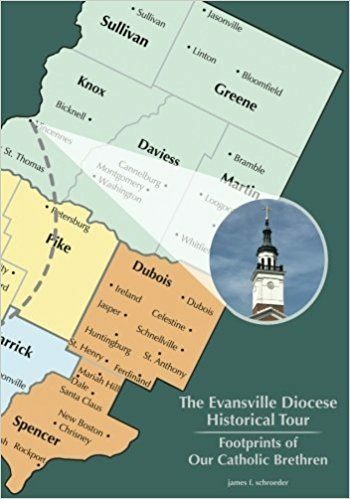 This account of The Evansville Diocese Historical Tour tells the story of this pilgrimage and the sites, sounds, and people which left an indelible imprint upon our family and those who traveled along.